This is an easy project and a good choice for older children who wish to make something a little different for Mother’s Day. The doily and silk flowers make this potpourri ball pretty to look at, while the fragrant potpourri gently scents the air. 1. Fill the bottom half of the plastic ball with potpourri and attach the other half of the ball. 2. If you like to crochet, you may wish to make the doily required for this project. However, pretty doilies are widely available and a purchased doily will work well in this instance. 3. Lay the doily flat and place the bottom of the ball in the center of the doily. Bring up the sides of the doily, pleating as smoothly and as tightly as you can. Fasten the doily at the top with a rubber band. 4. There are two options to cover up the rubber band. You can simply take some silk flowers, with leaves, and glue them all around the rubber band. Or you could hide the rubber band with a length of ribbon, tying it with a small bow, and gluing on just two or three flowers around the bow. Either way will be pretty, so just go with the look that you prefer. 5. 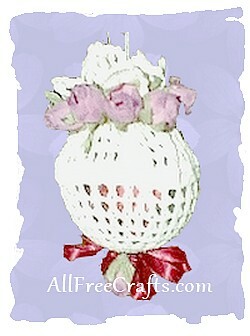 Make a six loop bow and glue it to the center bottom of the ball, adding a few silk flowers as well. 6. Attach some crochet thread, in a color that matches your doily, drawing it through a small eye hole at the top of the ball to use as a hanger. »»The holes in the ball make it easy to refresh the potpourri scent; simply let a few drops of essential oil fall through the holes onto the potpourri and shake the ball gently to distribute. »»When giving this hanging scented potpourri ball as a homemade gift for Mother’s Day, add a bottle of essential oil with a glass dropper.